Do you feel like Goldilocks in your home? Either it is too hot or too cold. It is never just right? Could your house be suffering from leaky home syndrome??? Is it curable? Drop down attic stairways, whole house fans, and hatches are notorious for leaking hot air into your attic. Many of them do not have weather-stripping or insulation on top of them in the attic. 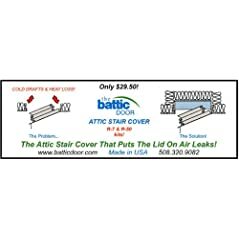 Battic Door Home Energy Conservation Products makes both attic stair insulator cover with an R-50 rating, and attic access door panel hatch with an R-42 rating. I do not have a pull down attic staircase, but do have a hatch. We put weather-stripping around the edge and sprayed icynene (open cell foam) on the top. I need to install latches on the side to keep it firmly in place. When it started to get cold outside, I would check at night if there were any cold spots on my walls. I found that a couple of walls were not insulated. When my prior house was built, a subcontractor must have removed the insulation to obtain access to the wall cavity and forgot to reinstall the insulation. If you have one section of your wall that seems very cold, it may be lacking insulation. You can either remove the drywall (which is the hard way) or hire someone to pump insulation into the wall. Use either Cellulose (newspaper) or Icynene (open cell foam). At this point in time, BioBased Spray foam (soy) can not be sprayed into a wall cavity that has been closed up with dry-wall. If you are unable to blow in insulation due to cost or you are renting, consider installing rugs on the walls as decorative art. Invest in door sweeps and weather-stripping for both your screen doors, outside doors, and yes, your attic door. Energy Federation Institute sells an automatic door sweep that moves up and down to clear carpets and rugs.If the staircase of your attic is inside the attic space, consider insulating the walls that are adjacent to your living space. Another way to check if you need to replace your door sweeps or weather-stripping is to turn the lights off in the area that you are checking. Then, take a flashlight and shine it at the bottom of the door or side of the door. If you can see light coming through, then you have air leaks. I did this same idea with my garage entrance door. I turned the lights off in the house, and turned my lights on in the garage. As plain as day, light was coming in under the door! Go around your windows when it is windy with an incense stick and see if the smoke blows the other way when you go by doors and windows. Another method espoused by the Department of Energy is to open your doors and windows and put a piece of paper on the bottom of the sill. If you can pull out the paper without it tearing, then you have air gaps. In addition, walk around the outside of your house and check for penetrations from the exterior of the house. Air can leak in from exterior penetrations. Be sure to caulk around all penetrations which includes all facets, electric outlets, cable wires, etc. You may need to re-caulk if the caulk is cracking. Wherever two different materials meet, there is a likelihood of air leakage. For example, I have brick around my wood framed door. There is a small crack between the two different materials, and I needed to caulk around this opening. Your exterior outlets and switches leak air. Home Depot and other hardware stores carry foam gaskets that you insert under the outlet plate. 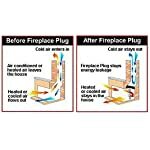 In addition, you can order online a variety of electrical draft stoppers on the website, BlackEnergy, or outlet and switch foam gaskets at goodcommonsense.net. To make sure your chimney does not leak, you can purchase a fireplace drafter stopper from Battic Doors, or install an energy efficient damper at the top of your chimney to reduce drafts such as a Lyemance Energy-Saving Damper. Green Talk readers receive a five percent discount on all purchase made by phone. Just mention “Green Talk.” Green Talk is an affiliate of Battic Doors and receives a small percentage of each sale to help defray some of the costs of the site. Note: There may be affiliate links in this article. Green Talk makes pennies on your purchases. Thanks for the loyalty. My garage used to leak a lot, but i solved it by getting a wonderful new garage door.